One of the coolest things about my trip to Boston was getting to meet a fellow blogger, Camilla, who writes one of my favorite blogs. 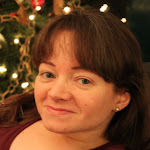 Although her blog has changed its primary topic in the last seven months or so, it is filled with stunning photographs, mathematical creative endeavors and, of course, the occasional cooking adventure. Every now and then, I've had an additional treat of seeing my brother, her former housemate, in a photo or two, and have been relieved to see that he was still alive. Camilla invited me and my dad to dinner to meet her, her husband, Monty, and her adorable son, Denton. She fixed an incredible dinner of roasted chicken that was culminated by a Yeasted Sugar Cake, with strawberries, plums and whipped cream. Plums and real whipped cream are two of my favorite things in the universe. Before I even left Boston, I had to order the Vegetarian Cooking for Everyone cookbook, which has the cake recipe. I'm sure I will give it a try soon. The next day she and Denton showed us around Mt. Auburn Cemetery, in Cambridge. Other than drive by shootings from the car, which I later painted, I'd never actually been to a cemetery before. Mt. Auburn Cemetery, which is 175 years old, is absolutely beautiful. It has gorgeous old trees and all the paths are paved, so it's a great place to walk around. I could have probably taken a few hundred more photos. We went there primarily with the purpose of birdwatching, but we didn't see any uncommon ones. Robins were particularly plentiful. I was also likely way too enthralled by looking at the trees. Saturday night, my van decided that it didn't want to open the automatic doors anymore. My dad spent rest of the weekend taking everything apart, trying to determine why. The motors in the doors were fine. The limit switches were fine. Unfortunately, he wasn't able to figure it out, but a signal is being generated constantly indicating that the doors should close. My dad is planning to drive it to Charlotte to get it fixed. Ordinarily, this would drive me up the wall, but since I recently drove over 1700 miles within a week and a half, I don't mind it so much. From that perspective it's really good timing. I'm also very happy that this didn't happen while I was on my trip! I haven't seen any sign of the skink. The Flying Fish is no more. It was actually bought out a couple of months ago and is now called the Gulf Rim. They pretty much have the same menu, with a few additions. They also painted the interior of the restaurant a hideous shade of orange. Granted, I think most, but not all, shades of orange are hideous. The Thai Cafe has finished their renovations for their new addition and it looks lovely. On their current menu, ACME Food and Beverage Co. has a shrimp and crawfish pasta served with heirloom tomatoes sauce that is both beautiful and delicious. This past weekend, they also had watermelon sorbet as a special, which was delightful. My dad thought you might as well eat a slice of watermelon, but I thought it was even more refreshing and certainly colder. I was eager to go to Bull McCabe's Irish Pub last night, after guitar practice, because I'd read several, mostly positive, reviews since it opened. It has interesting decor and I think the fully stocked bookshelves add a lot. It, however, doesn't have wheelchair accessible seating options and it looses quite a few points in my book because of that. There are picnic benches outside, which can be ok as long as the ends overhang some. Unfortunately, their benches aren't built that way. We sat there for a bit, before the bottom dropped out of a thunderstorm. By then, some of the indoor tables were free. Unfortunately, they were barely better, because they only have a few booths and they have supports at the ends of their tables. I really liked my fish and chips, though. The fish was crispy, but not excessively so. The french fries were nice and crispy, too. The creamy coleslaw was a little too soupy, in my opinion, but I'm picky about coleslaw. With the exception of a quesadilla, I was pleased to see that most of the items on the menu seemed appropriate for an Irish pub. This is in contrast to an Irish pub that I went to in Cambridge, the Asgard, which had more cosmopolitan fare. It seems wrong to order jambalaya or bruschetta in a pub, don't you think? Fortunately, visiting the Asgard was the pre-party after party for Oscelot's Open Source Day II, so I didn't let it bother me too much. 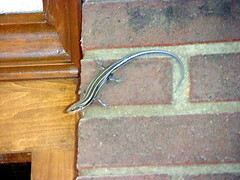 There is a blue-tailed skink loose somewhere in my house. I hope I don't find out where it is while I'm asleep. Wherever you are, no matter how far away, you will hear my startled scream, I'm sure. In other news, if you are at all interested in theatre or want to try something spontaneous and new, you might consider finding out more about an Improv Workshop that will be taught in Durham, August 17-19. People who know me, particularly in person, know that I can go on and on about Mary Chung's Chinese Restaurant on Mass Ave. (near Central Square), in Cambridge. Anytime anyone gets within a 50 mile radius of it, I insist that they have to go. Two weeks ago, I actually managed to get my boss to go by actually driving him there. He did go willingly, I think. I ate there three out of the nine nights that I was in the Boston area. I also insist that people order my favorite dish, Suan La Chow Show. It's a soup-appetizer dish, which contains pork dumplings in a tangy-spicy soy based sauce, with bean sprouts. Basically, once you eat the dumplings, the wait staff starts trying to take it away, so I don't think most people eat all of the liquid and sprouts. This dish is very hot, but it is absolutely delicious, in my opinion. Among other things, we also had scallion pie, also known as scallion pancakes. I really like these. We also had Lion's Head, which is a giant non-spicy pork meatball in a thin broth, with cabbage. It reminded us of krautrouladen, or cabbage rolls, a traditional German beef dish. Fortunately, it really was pork, since I still don't eat beef. It was incredibly good. I'd remembered liking Dun Dun Noodles, but I hadn't remembered that they are spicy enough to spontaneously combust. We also had Orange Sauce Chicken and Velvet Chicken, which were mild and excellent. The fried peking ravioli, fondly referred to as "ravs", which are basically potstickers, are also a must. Anyone who is willing to bring me back some Suan La Chow Show on a plane will forever hold a special place in my heart. Yes, I already want more. Now that I have some laundry started, it's time for me to write a little bit about my trip to Boston. I can't remember whether I've mentioned this here before, but I really like driving in Boston. It's challenging, with its maniacal drivers, its overabundance of one-way streets and the occasional unlabeled intersection. Lanes are almost optional due to people's parking in them and many of the lanes aren't marked with lines at all. Someone once told me that that every car in Boston has a dent, so I'm always happy to be driving a pre-dented van. Boston drivers expect you to suddenly pull in front if them, because you can't get anywhere if you don't. Boston drivers, for the most part, are alert because of that. You have to think and react quickly. I get the impression that over half the people in the Triangle aren't even paying attention to the fact that they are in a moving vehicle while they are talking on the phone, much less trying to drive it somewhere. My brother assures me that some Boston drivers don't pay attention either, but it's got to be the exception rather than the majority. On my morning commute from Hillsborough to Durham a lot of the drivers drive way below the speed limit, because they either don't have a clue or they are engrossed in their conversations. I'm not saying that my driving is perfect here, particularly when I'm talking to a passenger, but I do think I'm pretty alert, for the most part. Now, it's not just that I like driving in the city. I've hated driving in D.C. every time I've been there. 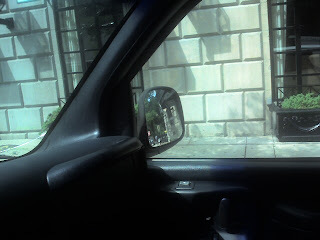 While many Boston drivers were polite and even waved to let me in, I've experienced many cases were drivers in D.C. were rude or made what I considered to be dangerous maneuvers. Of course, just a few experiences can color one's perceptions strongly, but I really get the sense that there is something pathological about driving in D.C. I was in stop and go traffic on the D.C. Beltline on Saturday and someone just stood on his or her horn when I was changing lanes. I was using my turn signal. I don't recall my being honked at once while I was in Boston. One bit of excitement was when I was driving down Mass Ave., toward downtown Boston, and I had to go through a tight squeeze. I should have slowed down more, but my side mirror hit the mirror of a truck that was parked on the right. It knocked my mirror out and the small-domed wide angle mirror popped off of that. Driving without both mirrors would be impossible. The main mirror was just a pressure fit, but the smaller one had been put on with double sided tape. I noticed that we lucky enough to have this happen just across the street from a convenience store, City Convenience. My dad ran across the street, got some double sided tape and taped the small mirror back on. The driver of the truck could have complained about the slightest scratch, but he was very nice and just made sure that none of the flying parts belonged on his truck. Boston is notorious for being a horrible place to drive, so I'm probably just deranged. I'm not sure my readers needed more convincing, though. 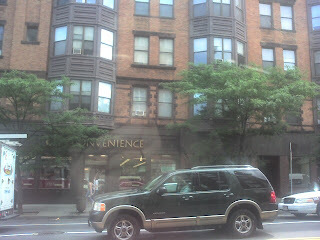 I've lamented in the past about the quality of the camera on the Treo 700p as compared to the Treo 650. Well, complaining is silly in this case, because I've finally played with my Canon SD500 camera enough to figure out how to get semi-great food shots in a restaurant setting, without flash. All I need is the macro setting and ISO 200. I hadn't read any reviews of Blu Seafood and Bar, which opened on 9th Street about a week and a half ago, so I had to try it out. The decor is much brighter and cleaner looking than the recently departed Grasshopper was. The service was very friendly and excellent. I decided to order the fried calamari appetizer and a salad. First we tried their bread, which was delicious. This was actually our second serving. The calamari was good. It wasn't the best I've ever eaten, but it was pretty good. It was served with lemon mayo, but I liked it better plain. I'm actually quite fond of Rockfish's calamari, which is surprising given that it's a chain. I would be interested to know where local readers prefer to get calamari around here. This was a great salad and it was much larger than it looks. It had tomatoes, shredded cucumbers, feta, onions, salad greens, small pieces of pita and a lemon-mint vinaigrette. I'm actually not a big fan of salads, but I enjoyed this tremendously and would happily order it again. In fact, I would probably just order the salad. Since I erred on the side of ordering too much, I didn't have room for dessert. They had chocolate fondue for two, for $12. I love chocolate fondue. Here's a picture of my father's order of paella. I was getting carried away taking high-resolution food photos and I thought the presentation was particularly nice. He would have preferred that it had more shrimp and fewer bivalves, but I would have liked it as-is and managed to steal a mussel. Happiness is returning home after 2 weeks and discovering that the coffee grounds that one left in the coffee pot have not molded. That's right, the proverbial newspapers at the end of this blog's driveway have been building up for a reason. I've been in Boston, for both business and pleasure, and drove home last night. I have lots of highlights, food stories and photos to share...in good time. One of the exciting events while I was gone was Blogger's enabling the easy routing of RSS traffic through Feedburner and discovering that I have not one or two subscribers, but more than twenty. I was stunned. Thank you all for reading! I've been trying out quite a few new things lately and you all should benefit from my thorough research. The iPhone. While I haven't actually touched one yet, I have seen my hippest friend use his. To put it bluntly, the iPhone makes my Treo 700p look pathetic. I really didn't think that it would be nearly as nifty as it is. The web browsing capability, particularly with wifi, is what really sells this product. Scrolling and zooming looks almost effortless and it is most certainly not effortless with the Treo 700p. Again, I am fortunate in that I will be spared from spending the $600, because I don't get service from AT&T anywhere where I would want to use it. As wonderful as the iPhone may be, I draw the line at having to drive somewhere else to use one. The take-home message here is that this blog, my blog, has now been bookmarked on an iPhone. That's worth more in my book than any technorati ranking I've ever seen. 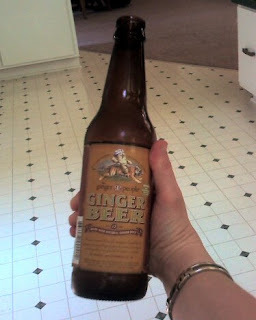 Ginger Beer by the Ginger People. I've been looking for a sodium benzoate free replacement for Blenheim Ginger Ale for months now. I've finally found one. It doesn't actually taste similar, but it many ways I think it's an improvement. It's barely carbonated, so it's far more drinkable. I've seen several people almost choke on Blenheim and that just won't happen with this beer. It's non-alcoholic and made with real ginger juice. One of my complaints about most brands of natural ginger ales is that is has some other fruit flavor added, like pineapple. This doesn't, which is great. Disclaimer: My most faithful reader of this blog thinks it tastes awful. I am now the proud owner of a Gorillapod tripod. This product is also way more awesome than I had imagined. I can attach it right to my chair. Not only that, but I've already imagined other things that I can connect to it. I'm planning on screwing on a something with a clip so I can have a music stand that will attach to almost anything. There's nothing worse than having one's music blow off the table while you're in the middle of a song. Ok, maybe there is. It also has a detachable piece that screws on semi-permanently to one's camera so you can easily dock onto the tripod. The only problem that it covers the SD card/battery compartment on my Canon SD500. That makes it a little less permanent, obviously, but it's still handy for short term use. Last night, in an attempt to use up vegetables from our Elysian Fields farm share, I made a stir fry that I thought was surprisingly good. I had the whole garlic cloves, the onions and the sugar cooking for a while, then I added the wine and the soy sauce. Next I put in the squash. I was adding it in as I was cutting, when I probably should have put it all in at once. I let that all cook on medium heat for a good long while, such that the liquid was boiling the whole time. The boca burgers, which I added near the end, soaked most of it up, too, which was great. My dad always gives me a hard time about not tasting my cooking while I'm making it, but it really turned out well in the end. I love making these things up as I go along. It was good with rye bread, but it would have been great over rice, too. This was the first time I'd ever peeled a head of uncooked garlic before. I was getting faster toward the end, but it's time consuming for the inexperienced. I figured through the various degrees of separation that I would know someone who would already have an iPhone. I do and, in fact, on Friday night, I was able to be in his presence during his hour or two of need while he was waiting for his phone to activate. I feel so much hipper for knowing him now and he was already one of the hippest people I knew. Much of that hipness has to have rubbed off on me, right? Not only that, but at least one of my co-workers has already handled an iPhone in an Apple store and I have seen the pictures which documented her very hand's holding a genuine iPhone. That makes me even hipper. It gets better. That same co-worker has been known to read this blog, so that even makes Eclectic Glob of Tangential Verbosity hip! I feel so much more special for not having experienced owning or fondling an iPhone myself and living through my friends vicariously, because it generously allows so many people to contribute to my existence.